I’d like to thank Comox Valley Growers & Seed Savers, especially Dianna Talbot, for inviting me to be part of their 2013 Garden Tour. I thoroughly enjoyed opening my frontyard vegetable garden to all the CVGSS members and answering their questions. It was also a great experience for me to join the afternoon portion of the tour. Being exposed to other types of local vegetable gardens was very informative and inspiring. 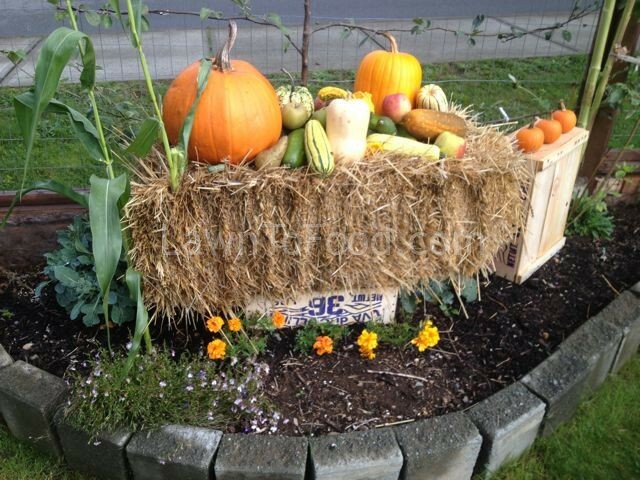 An Autumn display of vegetables & fruit. Children walking by the frontyard just love name all the different types of vegetables that they see. 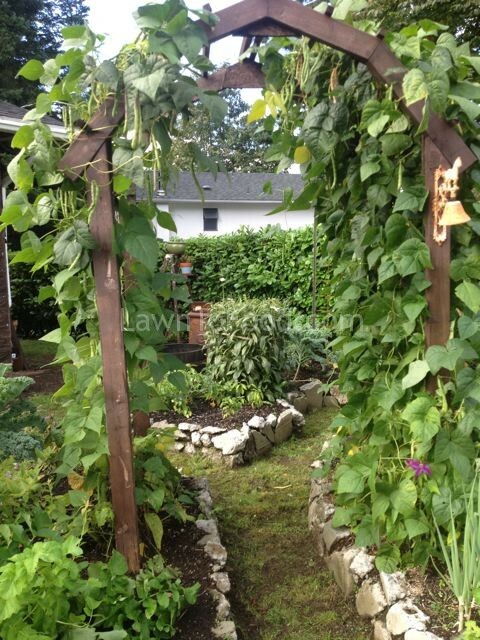 They are also welcomed to eat any raspberries, beans or cherry tomatoes that grow on the outside of our fence. I labelled some of the less common vegetable varieties for my Garden Tour visitors. This table of preserves was set up in the cucumber patch. I left one over-grown cucumber as I am going to save it’s seeds for next year. 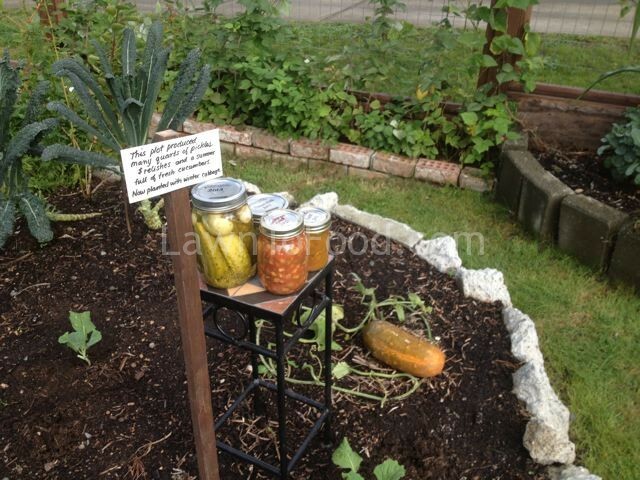 The informational sign says, “This plot produced many quarts of pickles, relishes and a summer full of fresh cucumbers. It is now planted with winter cabbage.” Dill pickles, sweet relish, mustard pickles and hamburger relish are on display. Many mature Blue Lake pole beans. 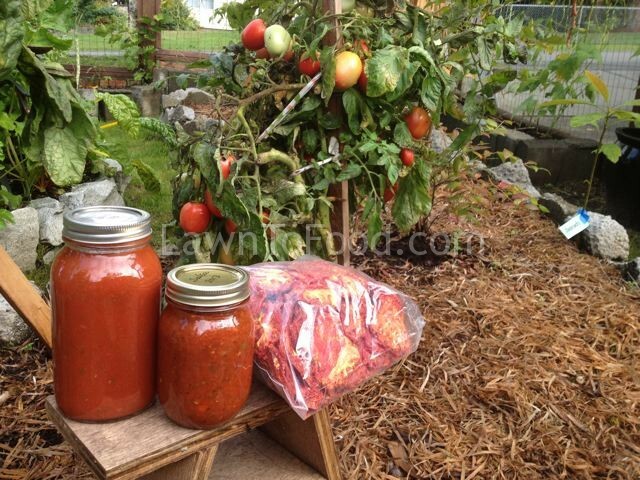 Zesty pasta sauce, spicy salsa and dehydrated tomatoes were also on display. In a jar, I layer dried tomatoes with garlic cloves, fresh basil, a pinch of salt and then fill it with quality olive oil. After a week of soaking up the flavours, we’ll have our own sundried tomatoes ready for pizza topping and other dishes. 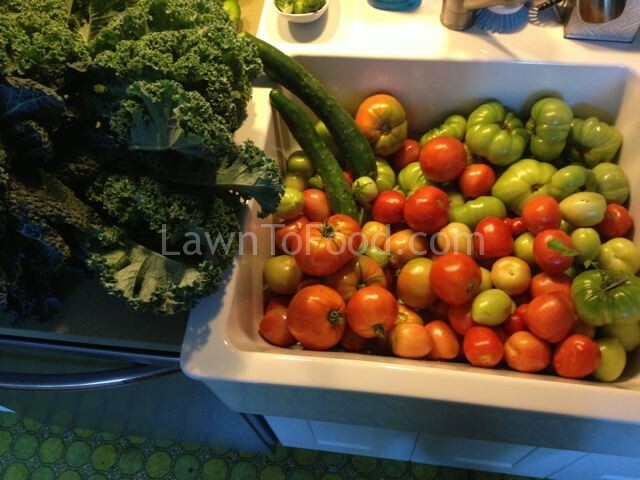 After the tour visitors left, I harvested the rest of the frontyard tomatoes before an expected storm. They are now washed and nestled on my warm window sills for ripening. 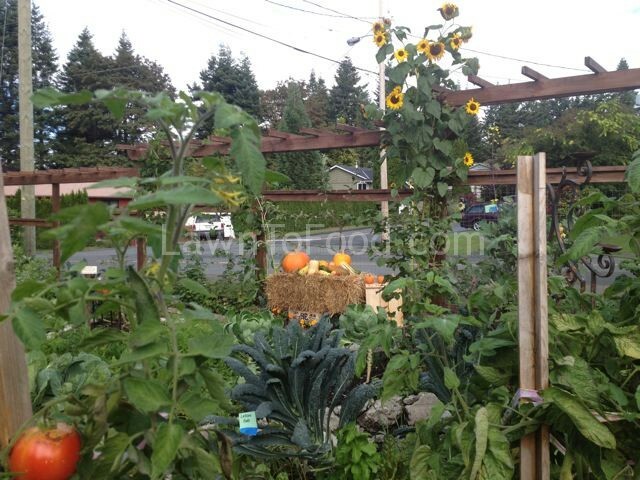 This entry was posted in Urban Farmstand and tagged garden tour by Lynda. Bookmark the permalink.